I'll be updating the tutorial once a .deb version is out.... for now you can move the script to usr/bin with ifile or ifunbox, rename it, and set all permissions to read, write, execute. The rest is the same as this tutorial, if you need help ask in the update thread. by MONGOLO 2013-3-10 if you want to share this tutorial on other forums, please give credit!! 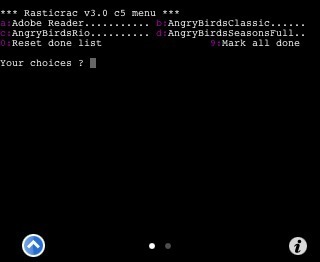 Not only will apps cracked with Rasticrac will run on armv7s devices such as the iPhone 5 and 4th generation iPad, Rasticrac can crack apps on these devices. Rasticrac works on iOS 6, but sometimes the same app on the same device will not crack on iOS 6, but will work just fine on iOS 5. 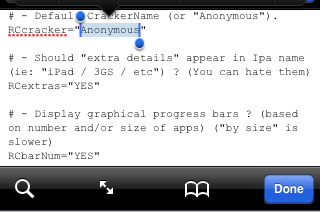 If you are new to cracking, you might want to try using AppCrackr, which is a bit easier and more user friendly. Appcrackr is a GUI for Rasticrac, so using AppCrackr produces the same results as Rasticrac. PRESS on the blue arrow to the right of the file name to rename the file, you should get this window. RENAME the file. I would recommend renaming it to rasticrac, because that's what it will be called in this tutorial. You can name it anything really or just leave the name as is, but it should be something short, it is cAsE sEnSeTiVe. The name you give it will be the command to bring up rasticrac in terminal. 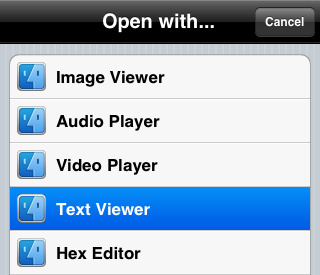 Now OPEN the file you have just renamed, you will be prompted for how to open the file, SELECT text editor. ...replace "anonymous" with your handle. Now to change the compression level. Scroll down until you see RCcompression. In between the quotes "" Enter a compression level between -9 and -2. 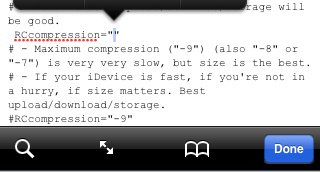 A higher compression level (-9 or - will give you a smaller file size but will take longer to crack. A lower level (-2 or -3) will crack faster but will give you a larger file. @MONG0LO Run "iTools", go "iDevice - Advanced", set "OpenSshTunnel=ON", then "rrc306.bat 127.0.0.1" should work over USB cable without wifi. 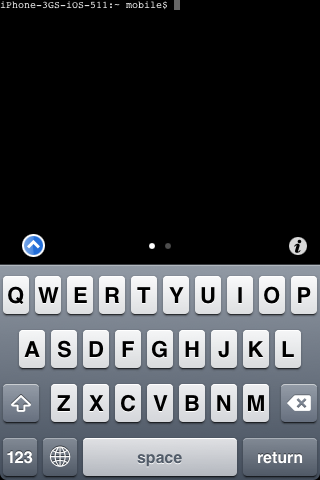 OPEN the terminal app on your springboard. You will get this window. This is the Rasticrac main menu. that you haven't cracked yet. You will get a screen like this when done. The IPAs are in /var/root/Documents/Cracked copy them to your PC with iFunbox and upload. If you didn't choose to use root access they will be in var/Mobile/Documents/Cracked. To mark all apps on the list as done enter command " 9 "
I can enter " c d ", putting a space beetween c and d, you can do this for as many apps as you like. If you need any help be sure and ask, you can find Rastignac, who created Rasticrac @iRastignac on twitter. Follow him for updates and more information. This is the right place to post, and thank you really much for this long waited guide! It will be put to forum digest when you finished! Thanks in advance! I haven't cracked anything in a while; last time I did I used clutch and that was before i had an iPhone 5. does clutch no longer work and if it does, is it no longer recommended? The admin privileges are not required for Rasticrac but only for Clutch. And use command "-all" (without "") for crack all uncracked ipa at once. what about the new ClutchPatched from FAULTYCLONES? do the cracked apps still crash on iphone 5? Some apps cracked using Clutch/ClutchPatched crash on new devices (iPhone 5, iPod Touch 4, iPad mini) on iOS6, here's a really simple fix for crackers and users. replace binary with the binary of the application. If you don't understand a word I said I suggest you not try it. Hopefully a new version ClutchPatched will be released soon that does this automatically,but for now you can always try this. thanks for the feedback! 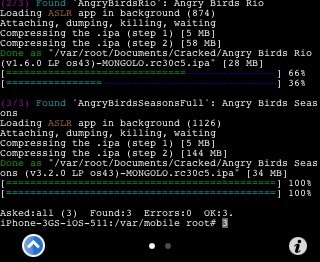 I have added that root access isn't necessary and also added a section on cracking multiple apps at once. Hello. I need your help. Sorry for the really stupid question but do not know how to solve. 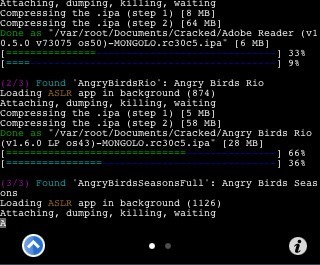 After typing the command "rasticrac-m", displays the list of all my app ... But since many do not fit on a single screen. In practice I can not see those made at the beginning because I miss scrolling in the screen. How can I fix? EDIT:Resolved. I told you she was stupid ... I had to plug right ... far to the right ... :-D Thank you all. can't work with infinity blades 2 1.3.2 can i use IDA pro to crack it? and what is the most interesting file for crack? info.plist or iTunesmetadat.plist? can i use IDA pro to crack it? 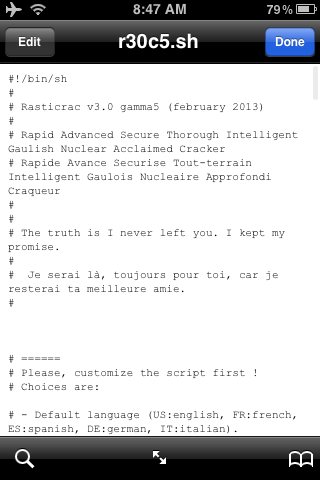 are you on the latest version of rasticrac? r30e7? If you installed through a repo you will need to manually update it. what ios/device are you on? i'm an iOS user for 2 week only. when you say edit them, to what are you reffering? Do you have GNU Debugger, ldone, and posix_spawn installed?